Yesterday was so busy and when I realized that I had let the week get away from me without getting or making a Father's Day card for my Dad, I jumped into action and threw this very plain and simple card together in about 10 - 15 mins. as my parents were on their way to my house. I am almost embarrassed to post it, it is so plain ... but my Dad loved it and I couldn't resist posting such a cute picture of him beaming with joy! He has always had an interest in old planes and now flies radio control airplanes as a hobby. Of course, in hindsight I think of all the things I could have done to enhance it, but Dad is not a bells and whistles person. But on my next ones I will use the masculine papers I have and put a little more time in it. I'm sure all of you could come up with WAY more creative ideas! 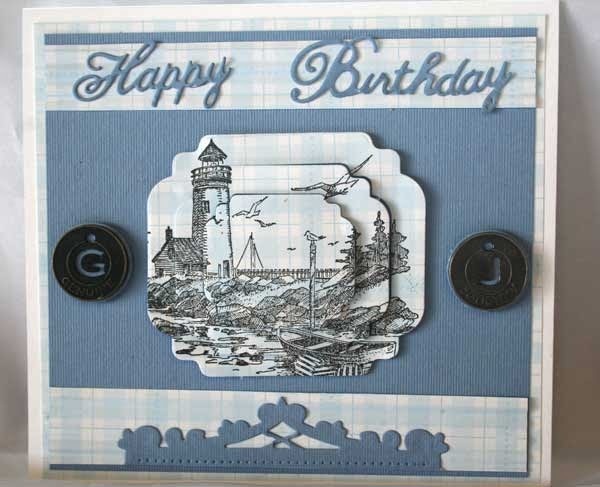 This is a card that Joan Fricker made and is featured in her Card Challenge #18 this week. Be sure to visit Joan's website at: www.joanstouch.com for details on her card and how to enter your creation into her card challenge. I will be awarding a prize to the challenge winner. Stay tuned this week for lots of new items that are out - I will probably be posting a couple each day.